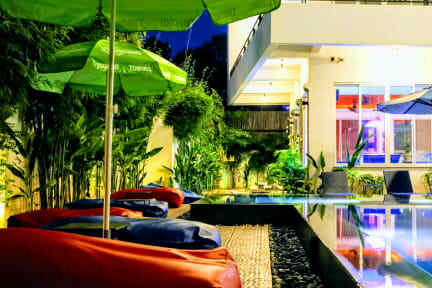 Our award winning hostel chain Hideout Hostels Asia brings to you the ultimate hostel in Siem Reap! The sister hostel of The Hideout Hostel Saigon - the busiest and most famous party hostel in Ho Chi Minh City. We offer a super social experience and awesome value set in a spectacular brand new ultra modern building with a large swimming pool surrounded by lush tropical gardens. Our busy hostel bar and restaurant offers super tasty food including a variety of asian dishes, tasty burger’s and freshly baked pizza’s plus happy hour’s throughout the day. Join us each evening for have a few games of pool or giant jenga plus we have event's each day! We have recently launched our charity pub crawls which run on Tuesday's, Thursday's and Saturday's. It costs only $5 per person for a wristband which entitles you to unlimited crawl's in both Siem Reap and at our awesome sister hostel in Ho Chi Minh City.